Both Crohn’s disease (CD) and ulcerative colitis (UC) present day-to-day as well as long-term challenges for the adolescent patient. Based upon a study, published in the journal Inflammatory Bowel Diseases, Dr. Laura Raffals offers insights into the association between teenagers’ diet and the risk of developing IBD. Prudent Diet: Characterized by high intake of vegetables, fruit, better quality grains, fish, and poultry. Western Diet: Characterized by high intake of desserts, sweets, snacks, red and processed meat, refined grains, and fries. 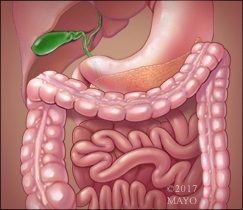 They observed a 53% lower risk of Crohn's disease among those with a high prudent dietary pattern; at the same time they found no significant association between Western diet and risk of CD. Findings from the study suggest that diet may have some influence on the development of IBD, particularly Crohn's disease, and Dr. Raffals advises all her patients with IBD to encourage their children to eat a healthy diet. Dr. Raffals is a gastroenterologist at Mayo Clinic.